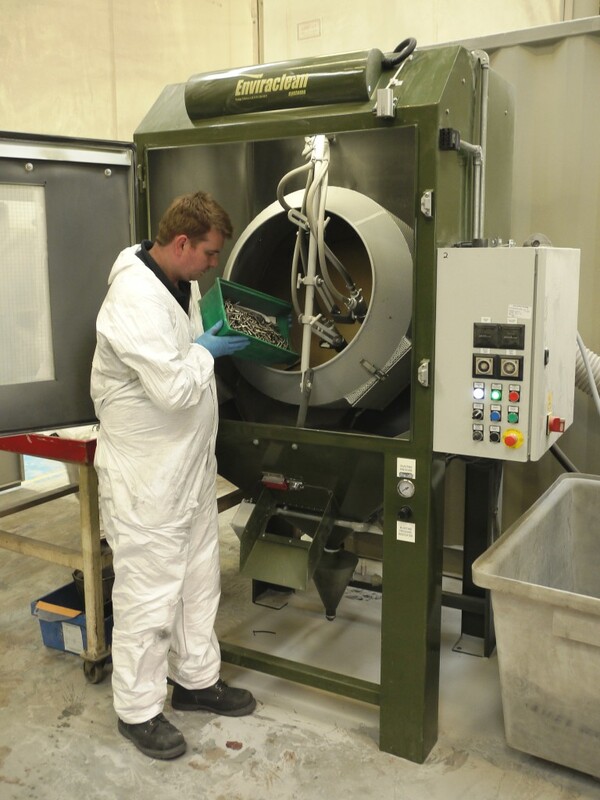 Installation of two bespoke blast cabinets from Hodge Clemco has enabled Acorn Surface Technology, one of the UK’s leaders in specialist surface engineering processes, to greatly increase throughput of critical aerospace fasteners at its Nottinghamshire factory. Large passenger aircraft typically require over a million fasteners, almost all of which are made of titanium. In order to prevent bi-metallic reaction between the titanium and the aluminium used to build the aircraft, the fasteners have to be coated with aluminium, using ion vapour deposition (IVD). The two Batchmaster cabinets installed by Hodge Clemco enable Acorn ST to meet growing demand from major civil and military aircraft manufacturers as the number they build continues to increase. The titanium fasteners delivered to Acorn ST’s works are below the final finished dimensions required, in order to allow for the IVD coating. After pre-washing to remove any grease, they are de-oxidised in the first cabinet, which also prepares the surface for coating. After IVD in large vacuum vessels, the second cabinet is used for peening the fasteners to densify the coating and complete the finishing process. Both cabinets incorporate a perforated steel basket capable of holding up to 25kg of material that is rotated by an external motor. As the basket turns, the fasteners are blasted with the appropriate abrasive from two blast guns. The basket rotation speed, position of the blast guns, blasting pressure, abrasive flow and process time are all controllable to ensure the surface finish and dimensions required are achieved. Reverse-pulse jet dust extractors with auto-timed pulse and automatic cartridge cleaning are incorporated to ventilate the cabinets, and a media reclaim system is also included, greatly reducing the amount of new material needed.